eggs | When Did This Become a Farm? I have to say that I am very happy with the grow out rates. This new organic feed is just amazing. I have not had a single fader or sick rabbit kit since switching to Modesto Mills. They waste far less of this feed than the other feed. They seem to enjoy eating it more. It smells so much better. When we switched to the organic feed we also switched to organic whole oats from Scratch and Peck and we made sure the hay we were getting was no spray and not alfalfa (which is basically all contaminated by GMO’s now}. The husband and I finished filling the last two garden beds today. We moved 1 and 3/4 cubic yards of soil. I put 3 trays of seedlings out into the sun for a few hours for the first time today and the last trays that were under the grow lights went out onto the porch today. Over the last two days the corn strip has been rototilled and planted and the potatoes we had planted in April have been weeded. We also planted more potatoes. I think we will definitely have enough potatoes for the year, Yukon Golds, reds, and russets. We will can most of them. After the corn is a foot high we will plant pole green beans in them as well as sweet meat squash. We decided to go for the 3 sisters. With the pole beans being planted with the corn, I can just plant bush green beans in the one bed. I was worried that pole beans would shade the raspberries, so now that won’t happen. The 10 tomato plants I put in are doing well. We are still having an issue with the one line of irrigation we put in so I’ve been watering the tomatoes by hand. I planted some more chard in Mom’s section of the raised beds. My zucchini has started to come up and one of my yellow summer squash plants. We are going to plant the sunflower seeds in the front garden area. I’ve got a nice variety so hopefully they will be really pretty. We took one of the top roosts down in the turkey coop. George was getting stuck between them and sort of having just to plummet down instead of fly and I think it was hurting his feet, plus he was rubbing off some of his feathers. He easily came down from the roost today without any help. He seems happier. Gina could always get down easy, but she’s a much smaller bird. Gina, by the way, is now laying her eggs in the duck coop in one of their nesting boxes instead of from the perch. The box isn’t really big enough for her, but she is managing. She won’t lay in her own nesting box. I’ve always thought Gina wanted to be a duck. She hangs with them now that she’s allowed out of the pen. She was sunbathing today with the ducks and her tail was all fanned out and she was half wallowed in the dirt taking a dust bath. I am so happy I decided to risk letting them out. I think it has improved their quality of life massively. Well, I best get to bed. We have a lot more to do tomorrow and I’m exhausted. The fur is in on Cinnabun’s kits. They were first, but then they were born first. There are definitely 2 solid blacks, 1 possible black, and 2 chocolates. The fur is about half in on Kalia’s and I can tell there are 2 that will be agouti, one that will be a steel, and one that is almost black, but not quite as it has a touch of grey and brown. Serena’s pinkies look frosted with white. 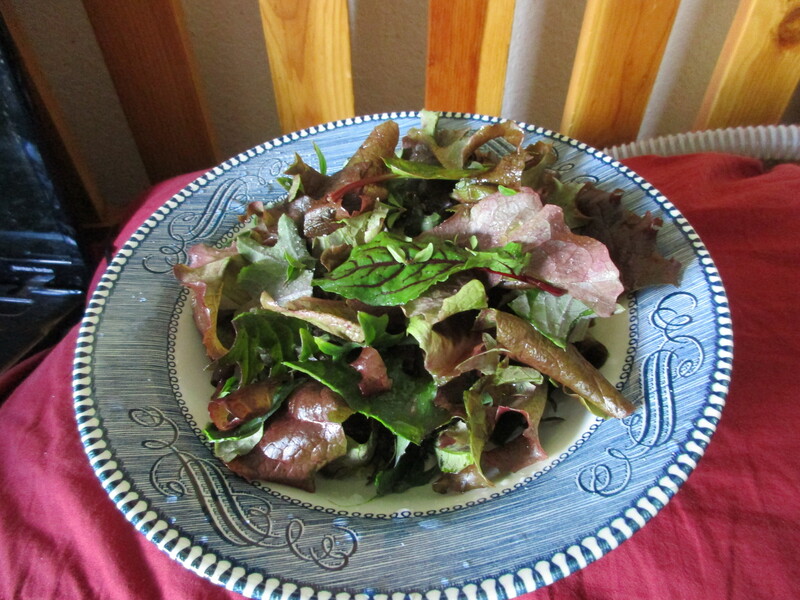 I had my first salad from the garden. It consisted of red loose leaf lettuce, Lacinato kale, blood-veined sorrel, common sorrel, and some thyme. The sorrels taste a lot like spinach, but are prettier. I was picking the kale on the side where the peas are, as they are trying to climb the kale instead of the trellis. We let the turkeys out of their pen today for the first time. Gina was so happy. She hung with the ducks. She would always stare at them as they’d file past the pen and I swear it was with longing. George seemed confused, mostly, but then George isn’t the brightest bird. Beautiful and loyal and bonded to Gina, but not too smart. Neither one of them really wanted to go back in at night, though. Gina led me a merry chase. George just let me pick him up and put him back in the pen. I will let them out again tomorrow. I was feeling sorry for them as they just have the coop and the 8 x 8 area. George is too heavy to fly much and Gina doesn’t want to leave George, so I think it is going to be okay. I will let them out on days that it is nice as long as I’m going to be around. So they will be part-time free range or yard range or whatever you want to call it from now on. I will be saving duck eggs for the next two mornings for a lady who wants to fill her incubator and has about ten spots open. She will be giving me a dozen calendula starts in exchange. I am happy with that bargain as I didn’t want to try to start any more things from seeds. It is very full under my grow lights. The girls are being pretty prolific at the moment so I hope they don’t slack off on the job. She also raises quail so when I am ready, I can get some from her, either chicks or eggs to incubate. They are the jumbo Coturnix which are the ones I want to raise when we do it, too. These quail take 8 weeks to mature to butcher size. I am thinking about raising some start to finish in the brooder box. I could do 20 in that space or 40 if I used both brooder boxes. They are 4′ x 4′. I’m not too interested in having more egg layers, just the meat, right now. But we will have to see. I am just not sure if I want to raise meat birds this year. I have been ridiculously busy this month with the garden and the animals. My camera broke ten days ago and I finally got a replacement for it. I don’t like posting blog entries without pictures or videos, so I was a little reluctant to update until I got a new one. I’ve been learning the ins and outs of the new camera for the last few days. I’ll have to figure out a wind filter, but otherwise I am pretty happy with it. The video is on the rabbitry and how they all are doing. I’ll have a few more update videos coming over the next couple of days and to whoever it was that wanted the PVC hutch frame plans and materials list, I haven’t forgotten. The husband just hasn’t gotten it together yet for me. He’s been busy, too. I have sold six dozen duck eggs this month, which keeps up nicely with the 5 to 6 eggs a day I am getting. So I made $29 ($1 off for someone who returned a bunch of egg cartons). We will likely sell some rabbit meat on Saturday, too. We got all the rabbit cages, except two washed on Sunday and we got the pregnant does into the Mama cages and gave them their nesting boxes. They are due on the 18th, so not long now. We still have to wash two buck cages. It started raining and got really windy before we got to them on Sunday and then Monday it poured. So hopefully we will get to them tomorrow. Today was building beds in the garden and moving old hay and manure into the beds. Tonight we will be moving soil. My Royal Palm turkey Gina laid her first egg. I am so excited. I was starting to get impatient as she will turn one on April 9th. I tried to get a good picture, but it really washed out whether I used the flash or not, but the egg is light pink with dark pink speckles all over it. Right now it is the size of a duck egg, but it will get bigger. Of course she did not lay it in the nesting box, she laid it outside in the turkey pen in the fresh straw we put down today. I am wondering if I need to make a nest box for outside, too. It was nice to collect an egg that wasn’t covered in mud and duck poo. It was clean like the chicken eggs usually are. I will have to do some research and see how often turkeys lay. I used to know, but I have forgotten. It was a year ago when I read the turkey books. This feels like a major step forward for the farmlet. All of the raised beds are now built. The big ones in the back are not full yet, but one of them is getting close. I will be so glad when the day comes that I have enough space to actually build proper compost piles and no close neighbors to worry about if something smells. We have gotten all of the old compost moved into the beds, though, with manure on the bottom. The last 4 x 8 foot bed will be filled with what the animals generate over the next few weeks. Once that is filled we will have to haul it off the property again. I’ve got several tomato plants that have sprouted. The Abraham Lincoln and Constoluto Genevese started sprouting on day 5. The Opalka and Lillian’s Yellow Heirloom started coming up today. Some of the lettuce has sprouted but some hasn’t. I think the seed might be too old, but I’ll give it a few more days and in the meanwhile, I will do a germination test tomorrow and if they are good, start some more. I drowned a couple of the cups and that may have been part of the problem, too. But I am very happy about the tomatoes. I can get lots of varieties of lettuce as starts, but the tomatoes around here are pretty limited to stuff like Early Girl, which produces well, but I don’t think is that tasty, and cherry tomatoes. Or stuff that has little chance of producing much in this climate, like Brandywine, because it has too long a growing time even when started early, but hope springs eternal to some folks when it comes to tomatoes. The rabbit kits are 3 weeks old and have entered their most adorable phase. It will last until they are about 5 weeks old and then they start getting less cuddly looking. I am really pleased with the litter from the Firefly x Wildfire cross. They are big and have beautiful red coats. Firefly is a first time mother so I didn’t know what to expect from her. All of the white kits are doing really well, too, though not as big as the reds. Luna has done a great job as a first time mother and Persephone as a second time mother. We will have 3 more litters due on the 18th of April. No first time moms in that bunch. But there will be two colored litters and one white. After that Ruby will get bred and she will be a first timer. I won’t have anymore first timers after that for quite some time and only if I get a black doe kit out of one of the mixed litters. I am not sure when we will be ordering meat chicks. I’d like to get a couple turkey poults to raise for the holidays as well, but they would not be able to go in with George and Gina until they were at least 15 weeks old and big enough to stand up for themselves, so I’m not sure if the logistics will work themselves out or not. They will be so much larger than the meat chicks by 6 weeks and they are supposed to eat a different feed, which makes it complicated. If the meat chicks actually get processed by 8 weeks then it might work out okay. But I may have to have someone else raise them for me this year. I am having someone else raise meat ducks, too. If I do get turkeys I want to get Blue Slate, Bourbon Red, or Narragansett this time. I don’t want to risk getting Royal Palms and mixing them up with the older birds. Since a Tom may not be fertile until two years old (sometimes sooner), harvesting the wrong turkey would set our eventual breeding program back a year). Getting ones that are distinctively different would prevent that. Gina has still not laid her first egg and she is almost a year old. She has oyster shell and grit and the right feed, but nothing yet. The ducks are laying semi-consistently. I am getting 3 eggs a day. I sold 2 dozen today to my son’s biology teacher, so that was $10. I need to contact my regular customer and see if she wants any more. It’s been a while since she bought some. I used up the two cracked eggs (were dropped after being washed) in some meatballs I made tonight. My meatball recipe calls for a pound each of ground lamb, ground rabbit, ground beef, and ground pork. Instead of plain ground pork I used a pound of the sweet Italian sausage from the portion of sausage sow we bought. I really liked it that way, so we will definitely use it up like that, I think. I am tempted to sub out one of the meats for ground duck meat in the future, only the only ground duck we have left is already shaped into patties, so maybe not. The chickens are also laying consistently without a light. I am worried a little about Mom’s elderly chicken Kyri. She is 4 next month and she walks like a little old lady and when she sits she looks like an owl. I’m not sure she’ll be with us much longer. When she goes, that will be the last of the first chickens we raised here. Everyone else is two or not yet one. Kyri gets extra little treats when the other chickens aren’t looking. She is a good hen and is still laying about 3 blue-green eggs a week despite her age. When she goes we’ll only have 2 Auracaunas left. I know laying hens don’t live forever, but I do get attached and I will miss her when she dies.